Banking and finance has come a long way since its inception. At first, people would store their gold with goldsmiths as it was too bulky to carry around and in exchange, the goldsmiths would give them a piece of paper that proved that they had a claim over a particular amount of gold that was being stored by the goldsmith. This slowly evolved to the modern banking halls where at first people would have to go and queue, sometimes for hours on end, to deposit their money or withdraw from their precious savings. At first, the Automated Teller Machine (ATM) became like the eighth wonder of the world. The machine allowed quick withdrawals, all you needed to do was put in your ATM card, punch in your PIN number and voila! Cash in hand. Soon it started accepting deposits too, but that was not the end of banking and technology. Trusted by a number of users, Pageonce is a secure personal finance app using which, they can easily track, control and pay their bills wirelessly. 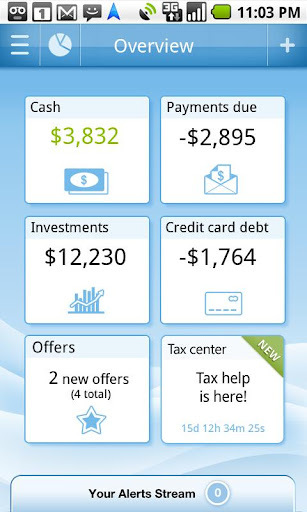 This app is particularly useful for those, who usually forget all about their bills after receiving them. Pageonce contains features such as tracking money and all sorts of bill, receive bill due to date reminders, view bill statements etc. Along with these features, the users can get real-time alerts for all their accounts, keep tabs on their investment portfolio and track mobile minutes, text and data usage easily. This is one of the most comprehensive budgeting and tracking tools. The app boasts of unique features including the ability to monitor all your accounts, make your budgets, track your expenses and get savvy tips on financial matters. It is one app that is a must have for everyone! This handy little app makes grocery shopping much easier. It creates a digital shopping list for you and keeps a record on the order in which you normally tick off items thus it prioritizes the list for you. It also lists the prices of these items at different stores, helping you to make the right choice to save some cash. It even allows you to save your favorite recipe on it and the ingredients you need to get! If you are a discount hunter and just love the good bargains you get due to your loyalty coupons, then key ring is the app for you. It allows you to save all your coupon information online and all your relevant account information, eliminating the need to walk around with a wad of coupons every time you go shopping. With keyring, you can say goodbye to those embarrassing moments when you are holding up the grocery store queue, going through your pockets for that discount coupon you know you have. This is not your typical budget organizing and expenditure-monitoring app. It includes some great features that make it stand out, including investment summaries, budgeting accounts and even information for your 401k. You can even create a watch list, and stay updated on the latest financial quotes, news in the stock market and bits of financial wisdom every day. This is great especially for small businesses. It simplifies expense reports, allowing the user to scan various receipts and import their credit card transactions from the web, then submit them to the app, which then generates a comprehensive expenditure report. The app also has provisions for calculation of mileage thus includes transport expenses to the report, which is then emailed to you. About the Author: Nick Thomas is a finance expert and consultant. Through his site he advises about financial matters and recommends the use of Interest rate calculator apps for calculating interest accurately.